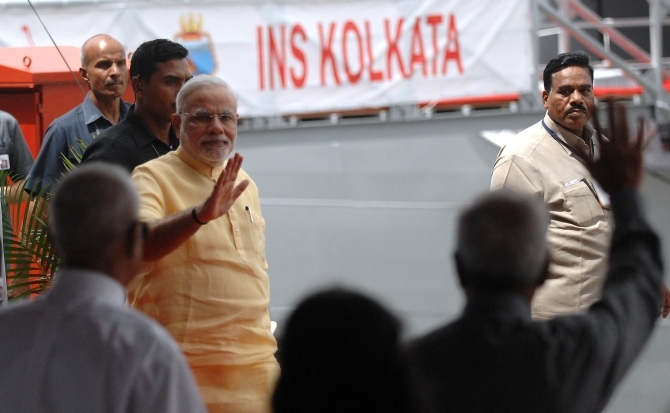 Prime Minister Narendra Modi commissioned the country's largest indigenously-built warship INS Kolkata in Mumbai. 3. INS Kolkata is our largest indigenous warship, for this I congratulate everyone associated with the project. 4. When I talk about the Navy from here in Maharashtra it is natural to remember Chhatrapati Shivaji. 5. Chhatrapati Shivaji understood the importance of securing the seas for increasing trade. 6. We can guarantee no wars when our military is modern and superior to any other country’s force. 7. In the Budget we have taken several steps for defence offsets. We dream to make India strong to export defence equipment to the world. 8. The entire nation may not be in uniform but we stand firmly behind you and are proud of you. Image: PM Modi addresses the crowds during the commissioning.